Jewel Homes - Selling, Renting, Buying and Investing Property. 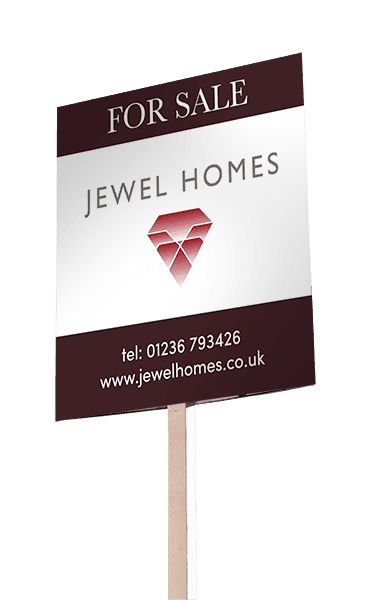 Jewel Homes is a highly professional, experienced estate agent Coatbridge and Paisley based, founded when a substantial gap was discovered for customers to receive outstanding property services and be treated with respect. As an estate agent covering Airdrie, Coatbridge and other areas in East Central Scotland, we pride ourselves on exceptional customer service whether you are looking for a home or selling or letting one. There are no surprises when it comes to helping you sell your home. From the outset, we will inform you of our fixed fee if we successfully help you to sell your home to ensure clarity and transparency. Our comprehensive knowledge of the local area as leading Coatbridge and Paisley estate agents with a host of local landlord and property owners utilising our services, means we are able to match up prospective tenants and buyers with excellent local properties. Our services are always fast, comprehensive and fair. Whether you are just starting out or are already established as a landlord, we can provide a tailored or fully comprehensive and efficient service that offers an excellent return as one of the leading estate agents Coatbridge, Paisley or anywhere else in Central Scotland has to offer. We provide a range of additional services to our property management options. We can offer full home reports/surveys, conveyancing and brokering services as well as professional smoke alarm installations and fully qualified gas safety checks. Our investor services provide the technical expertise and local knowledge to ensure that you can make the best property investment and get the most out of it. We value getting to know you and intimately understanding your situation to find precisely what you need. We also believe in open, honest and continuous communication so you know exactly where you stand with Paisley and Coatbridge’s top estate agent. An extensive knowledge of the Lanarkshire area and local property market means that we can offer an unrivalled service to those looking to invest, let or rent in the area. Our staff offer over 9 years of real estate experience. Whether you are looking to sell your property, invest in quality property, rent locally or let your property, our dedicated team are on hand to ensure you get the best service available. I just want to say thank you for making my first UK property investment so extremely smooth and stress-free! I am still so surprised with what we managed to achieve... it’s been exactly 3 months from the moment I decided I was keen to buy, to the day tenants have moved in?! I've gained a great deal of experience and I owe it all to you... Thanks! And I look forward to planning my next investment with you again soon! I have now bought 3 properties sourced by Ky Le Vuong from Jewel Homes and they have all turned out to be excellent investments. I've also had access to a brilliant power team (broker, solicitor and builders), which has made the whole process quick, easy and pleasurable. Highly recommended in my opinion and looking forward to my next one with them. Working with the Jewel team has been great - we've recently completed on a property, getting the necessary refurb work completed and a strong tenant found in less than a week. The tenant is now in and really happy. Communication with the team has been open and clear throughout, as well ensuring that all checks and regulations were clearly met. I'll definitely be looking to work with the Jewel team again for future properties. Upon being recommended to Jewel homes by a friend, we were presented with a number of high quality properties that met our BTL investment requirements. Once we had selected the property that best suited our strategy; Ky Le, Stewart and the team at Jewel homes set about securing the deal and processing the transaction on our behalf. The communication, updates and explanation of the process to purchase a property in Scotland has been fantastic – could not be faulted. Ky Le was in constant contact with me and personally oversaw the transaction making sure there were no hold ups. From making the offer to completing the deal and receiving the keys was less than a month – something un-heard of in the property world and this is all thanks to Ky Le and the team at Jewel homes. I can highly recommend their services.